Celebrate everything Irish by displaying one of our St. Patrick's Day flags. 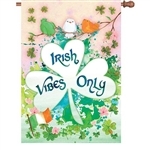 IRISH VIBES ONLY Garden Size Flag - 12" x 18"
IRISH VIBES ONLY Standard Size Flag - 28" x 40"
CLOVERS AND TOP HAT Decorative Standard Size Flag - 28" x 40"
CLOVERS AND TOP HAT Decorative Garden Size Flag - 12" x 18"
LUCKY LEPRECHAUN Decorative Standard Size Flag - 28" x 40"
LUCKY LEPRECHAUN Garden Size Flag - 12" x 18"
Blooming Irish Decorative Flag - Garden 12.5" x 18"
Luck of the Irish Decorative Flag - Garden 12.5" x 18"
Pot of Gold Decorative Flag - Standard 28" x 40"
Pot of Gold Decorative Flag - Garden 12" x 18"
Happy St. Pat's Hat Decorative Flag - Standard 28" x 40"
Happy St. Pat's Hat Decorative Flag - Garden 12" x 18"
St. Pat's Shamrocks Decorative Flag - Garden 12.5" x 18"
Lucky Charm Decorative Flag - Garden 12" x 18"
St. Pat's Clover Decorative Flag - Standard 28" x 40" - $2 OFF!! 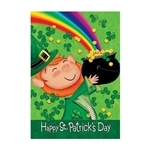 St. Pat's Clover Decorative Flag - Garden 12" x 18"
Get Your Irish On Decorative Standard Size Flag - 28" x 40" - $2 OFF!! 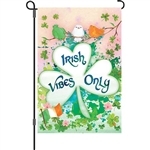 Irish Welcome Garden Size Flag with Tails - 12" x 20"
Patterned Shamrock Decorative Standard Flag - 29" x 43" - $4 OFF!